Save money at Chicago area used book sales. Used book sales are a great way to buy books on the cheap and to help library systems raise badly needed revenue. It’s also great for the environment when we reuse old books rather than buying new one’s. Always call to confirm all information before heading out as information is subject to change. Check every listing here. Bring strong bags to carry your purchases. Also bring small bills and coins because you really don’t want to break a twenty to buy $3 in books. Also note that many libraries have ongoing sales including the Chicago Public Library system. Ask the librarian where the sale books are located. Sale will be held at the upper level Community Room of the Rolling Meadows Library, 3110 Martin Lane, Rolling Meadows, Illinois. 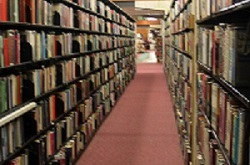 As a non-profit organization, we provide funds to the library for special equipment, programs and events of interest, not only to Rolling Meadows patrons but also to the surrounding communities. 75,000 books; 80% donated; 56% hardcover; includes DVDs, records, CDs, tapes; paperbacks .50-$1; hardcovers $1; teachers: 25% off, must show ID. Adult Sale: Half-Price DVDs, CDs, Vinyl records, VHS. Children’s Sale: Sunday $5/bag Silent Auction Sat 9-2. No scanners, cell phones, computers, etc.